Wailea, Hawaii and Irvine, Calif. – R.D. 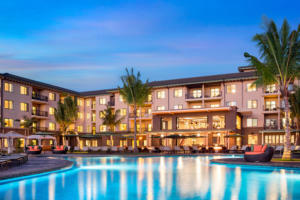 Olson Development, in partnership with Joseph Martelli Real Estate Investments Inc., has opened the 200-room Residence Inn by Marriott hotel in Wailea, Maui, Hawaii, marking the second Hawaiian development for the Newport Beach, California-based developer. Executives from R.D. Olson Development, Marriott International and project contractor R.D. Olson Construction joined civic leaders including Mayor Alan K. Arakawa at the grand opening. With the highest revenue per available room (RevPAR) in the United States, Wailea is a luxurious resort community that draws millions of visitors each year. The project, which is the first Residence Inn by Marriott on the Hawaiian Islands, is also the first property in the Wailea market designed to accommodate more budget-conscious family travelers. Located in the heart of Wailea near The Shops at Wailea, beautiful Wailea Beach, the Wailea Beach Marriott Resort & Spa and the Grand Wailea Resort, the Residence Inn by Marriott at Wailea provides ample opportunity for family members of all ages to take advantage of the Hawaiian lifestyle. Wailea spans more than 1,500 acres in South Maui, and features five crescent-shaped beaches, high-end golf courses, world-class restaurants and shops, and regular entertainment at various venues. Whether walking or taking advantage of the hotel’s complimentary shuttle to nearby amenities, the prime location puts access to Hawaiian culture and adventure at guests’ fingertips. Residence Inn by Marriott Wailea is designed around a theme that pays homage to the local Hawaiian culture, evoking an inherent Hawaiian ambiance that touches on heritage as well as current local culture. The architectural detailing of the traditional plantation style creates an authentic underlying tone throughout the design. Elements that tell the story of a historical culture filled with customs and symbolisms, as well as unique art and materials relevant to modern island lifestyles, are also incorporated throughout the property. Throughout the public and guestroom spaces, the use of familiar Hawaiian patterns, textures, and colors build upon the picturesque landscape, with design that draws on the nature, culture, and the mystical legacies of local customs. The integration of modern surf art created by genuine surfers, and traditional paintings from local artists, paired with historical and antique artifacts are comingled to leave quests with a memorable experience that is current, unique, and slightly unexpected. The 175,000-square-foot, all-suite hotel is designed with a room mix that includes 200 spacious studio, one- and two-bedroom guest suites, all of which are nearly 50 percent larger than traditional hotel rooms. Guestroom suites, designed with extended stay guests in mind and ideal for traveling families looking for more spacious accommodations, offer separate living, sleeping and working areas, as well as fully equipped kitchens featuring high-end appliances including a refrigerator, stove, microwave and dishwasher. Rooms also include spa-like bathrooms and ergonomic furniture, creating a comfortable environment for guests. Guests benefit from a variety of public amenities such as a complimentary, full hot breakfast buffet, a large fitness center with the latest cardio, weight and stretch equipment, free high-speed Internet access, a business center, and guest laundry. The property also features a 24/7 Market, which provides easy access to grab-and-go snacks and other necessities. Allowing guests to take advantage of the beauty of Hawaii, Residence Inn by Marriott Wailea offers a variety of outdoor spaces for guests on its 6.3 acre lot, including a sports court, putting green, a grilling area and barbeque with tiki torches, fire pits, and a 3,500 square-foot swimming pool area complete with a pool bar. An aluminum panelized folding wall system separates the hotel from the pool deck, allowing guests to enjoy the benefits of the local climate and seamlessly connecting the entire property to the outdoors. Additional areas that benefit from the open air feel of the Hawaiian environment include the hotel dining room and front entry, which are both open to the outdoors.